Fall snuck up on me this year. One day it was hot and humid, the next it was all golden leaves and cooler temperatures. The last few days have been down right chilly. I’m not complaining, I’m celebrating. Fall is my very favorite season! The cake is quintessential fall. The richness of the caramel icing and the sweetness of the apple filling are things that just cant be fully appreciated in the heat of the summer. They need a cool breeze to feel at home. It’s inspired a recipe in the September issue of Food and Wine, a cake called the Revelatory Cake. It’s from the cookbook The Southern Foodways Alliance Community Cookbook, which I cannot wait to get my hands on. It’s co-written by John T. Edge, whose work I have admired since I first heard about him on The Splendid Table. Mine is quite different from the original though. I used Dorie Greenspan’s Perfect Party Cake and filled mine with an apple filling. The icing is the only thing I used from the original recipe, and it is delicious. Put the sugar and the butter in the bowl of an electric mixer and, working with the paddle or whisk attachment, or with a hand mixer, beat at medium speed for a full 3 minutes, until the butter and sugar are very light. Beat in the extract, then add one third of the flour mixture, still beating on medium speed. Beat in half of the milk-egg mixture, then beat in half of the remaining dry ingredients until incorporated. Add the rest of the milk and eggs, beating until the batter is homogeneous, then add the last of the dry ingredients. Finally, give the batter a good 2-minute beating to ensure that it is thoroughly mixed and well aerated. Divide the batter between the two pans and smooth the tops with a rubber spatula. Combine all ingredients in saucepan and cook until apples are tender. Sprinkle the remaining 1/2 cup of sugar in a deep, heavy saucepan. Cook the sugar over moderate heat, swirling occasionally, until an amber caramel forms. Carefully pour the warm milk mixture over the caramel. Cook over moderately high heat, stirring, until the caramel dissolves. Stop stirring and cook until the caramel registers 235° on a candy thermometer. Remove from the heat. Stir in the butter, vanilla and 1/4 cup of the heavy cream. Strain the caramel into the bowl of a standing mixer. Let cool for 15 minutes. Set 1 cake layer on a plate. Top with apple mixture. Add the top layer and pour icing over the top of the cake, letting it run down the sides. Working quickly, use an offset spatula to spread the icing gently around the cake. Let the cake stand for 2 hours to set the icing before serving. 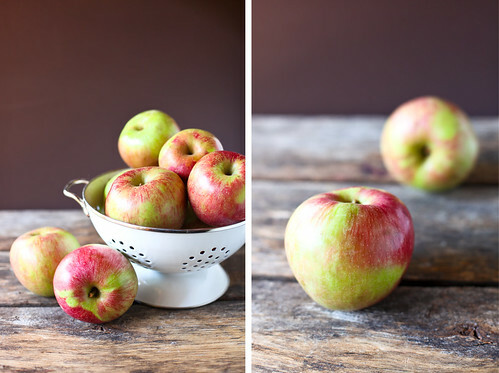 I am in love with all things apples (and caramel, obviously) - this sounds divine Hannah! 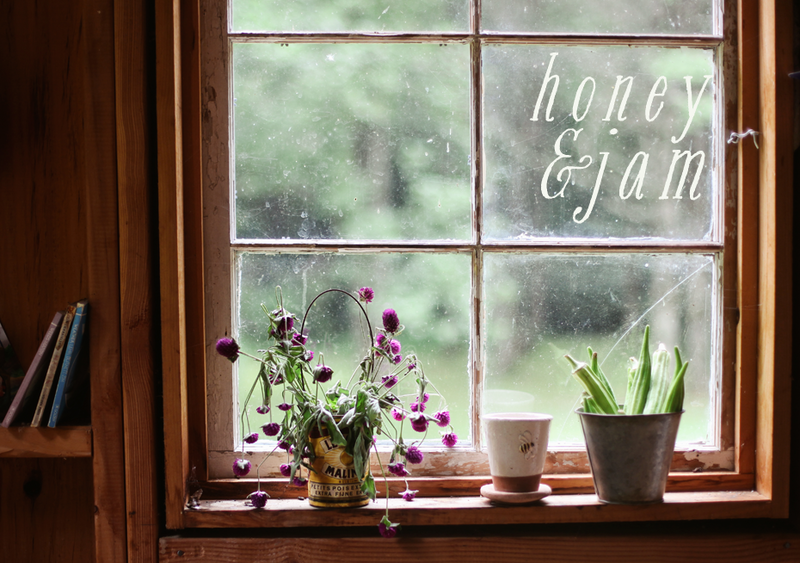 So happy to have a new post from Honey and Jam! Gorgeous and looks delicious! Beautiful as always and delicious looking cake. That icing sounds perfect! That sounds and looks yummy! are you kidding me. this sounds amazing. i may have to try it out for Thanksgiving! thanks, Hannah. maybe Texas, you don't live in Texas do you? tehee. Yum, yum, yum! A perfect recipe for the upcoming weekend! Glad to see a new post! Even though you swear to be "the worst cake froster ever," I think you a fine job. And as long as it tastes great, you shouldn't sweat a little poke of crumbs or uneven blog here and there. Oh Yum!! So very fallish!! love it!! What a great take on the perfect party cake. That sounds so delicious especially with those wonderful flavors blended together. I'll definitely have to save this recipe for future use. Thanks for the great ideas. this looks great for fall! it's great to have up back to blogging.. you were missed! 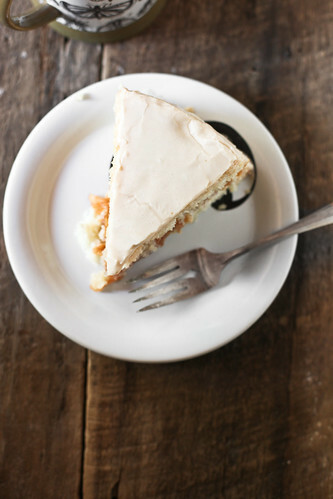 Gorgeous clicks and delicious cake! I'm so glad fall is here! This has nothing to do with the fact that I've made it through one hot and sweaty Georgia summer while pregnant (okay, maybe a little bit) and everything to do with scarves, pumpkins, apples, and crisp air! Best combination ever! you know at first I thought I had read "Apple cake with caramel filling" which can't be a bad idea either, but this one is much more original! Thank you, I adore your site. This sounds so delicious!! Gorgeous pictures! Sounds amazing! I love Fall desserts! 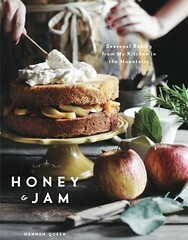 oh, and I love the new banner and the new honey&jam logo. gorgeous gorgeous pictures! as for the cake - i had my eye on it for a while. now i need to make it! I don't know of anything more perfect for fall! It looks like a good classic cake. I'm glad you have your camera back! Not many things are better than apples and caramel! The cakes sounds delicious. Yumm. quintessential fall indeed. Your pictures are so perfect! i love them! Your pictures are absolutely stunning. I would love a slice of this cake! Yum, that cake looks delicious. I'm wondering if you can give a few tips on the frosting. I tried to make the Gourmet version of this cake and the frosting never thickened, which seems to be a common problem. How did you get yours to thicken so nicely? I love apples... That cake looks lovely! And, your pictures are absolutely stunning, as always. 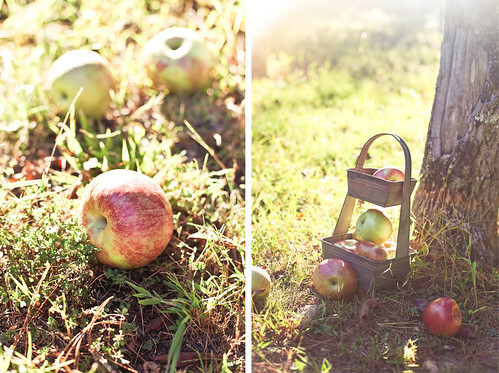 I'm going apple picking tomorrow and am SO excited! I've never been. I was supposed to bake that caramel cake in Food & Wine for a friend's birthday but I didn't end up having time! It's still on my to-do! Your pictures are gorgeous, as always! I think I'm making this this weekend. It looks perfect. oh wow! this is one awesome cake! perfect for Fall! Ah, yes, I bookmarked this one, also. Happy Fall, to you, Hannah. It's grand, isn't it? Apple and caramel is such a heavenly combination. Thank you for sharing the recipe. Yum! Have a wonderful Fall! Oh my goodness, does this sound good! Not only does it sound wonderful but your photos are amazing! Great JOB! stellar. you've taken the perfect party cake and improved upon it--well done! Love that Southern Alliance Community Cookbook. How rad is that?! Not sure why I haven't been over to your site recently Hannah, but it's lovely as ever. Here's to crossing my fingers it'll start to feel a little more like fall in the Bay Area soon. Happy (almost) Friday! This is a fabulous recipe, Hannah! It really IS the perfect fall party cake. Apples! Thanks for the post. Even here in northern Italy the apples now are amazing. As usual, always look forward to the next post! Oh, now this is going to have to be made! i love caramel! i want a slice so bad! i wish i could make more of it. Hi Hannah. I left you an award over on my blog. I hope this finds you doing well as we haven't heard from you in a while. Hannah, the photos are gorgeous as always, you're such a talented photographer and cook, the cake looks and sounds delicious! Ok, so that looks absolutely wonderful! These pictures are making me feel all warm inside, not wanting to wait another minute for summer. Will try one of your recipes and post it on my blog soon :) Love your page Hannah! 10 thumb interesting information for you!